To answer, the government hopes, is in a new guide issued by the Canadian Centre for Cyber Security, the recently-established federal advisory agency on security. It’s a unit of the Communications Security Establishment, responsible for securing federal departments. 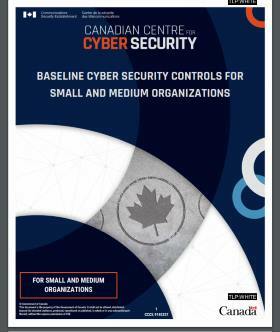 Called the Baseline Cyber Security Controls for Small and Medium Businesses, it offers SMBs advice on getting the biggest bang for their bucks. There’s a lot of public information available to help organizations create a cyber security program, Colin Belcourt, the centre’s director of standards, architecture and risk mitigation, noted in an interview. “We felt there was a gap in the information available for small and medium organizations. Interestingly, the baseline controls section suggests first creating a written plan for responding to and recovering from cyber incidents.”Start by thinking something is going to eventually go wrong,” Belcourt said. Consider questions like, who will be in charge of the response? Who will contact employees, customers, shareholders, regulators? In fact, not having a response plan is one of the worst decisions SMBs can make, he said.